An entertaining little game where you control a ball and have to wipe markers off coloured tiles by rolling over them. Of course, there are various nasties to impede your progress, and chasms will have to be crossed to reach some otherwise inaccessible parts on each level. Then there are some markers that will only appear if you touch a square with a special symbol on it... and don't wipe too many markers of the same colour! The graphics are very colourful indeed and suit the game perfectly, and while it's maddeningly frustrating to start with, it quickly becomes addictive, and you have a generous supply of lives as well. Rolling Thunder has you playing secret agent extraordinaire Agent Albatross, who must infiltrate a secret gang of masked bad guys and put them out of business. 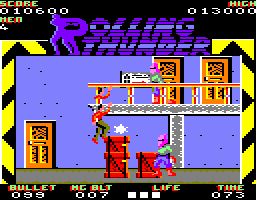 The first level sees you doing this by walking from left to right, jumping from the bottom of the screen to the walkway in the middle, shooting an endless stream of baddies, and hiding in doors to replenish your bullets and escape from the endless torrent of bad guys. You'll also find that – should you get that far – the second and third levels (and no doubt beyond) are almost identical to the first one. The graphics are good and fluid – Albatross moves quite realistically – and the sound effects are serviceable. It's just that the game is so repetitive and boring that you'll soon be turning it off. 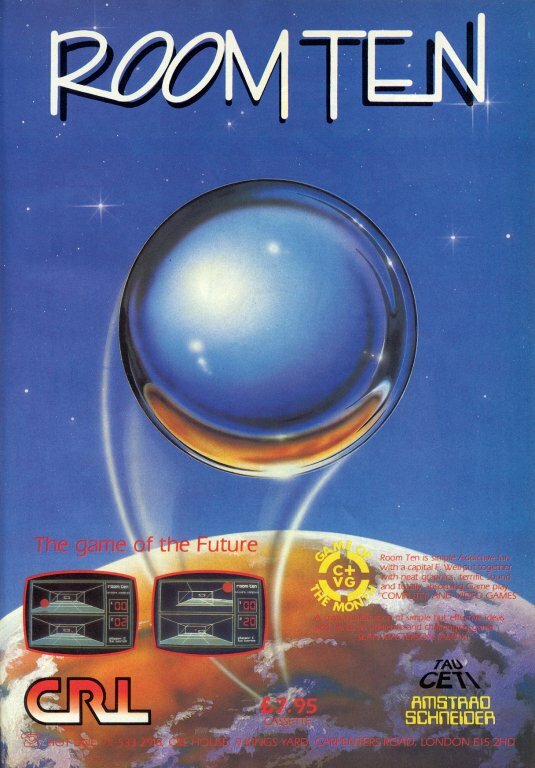 The Galcorp Leisure Corporation has devised many games which can be played on low-gravity moons and asteroids. 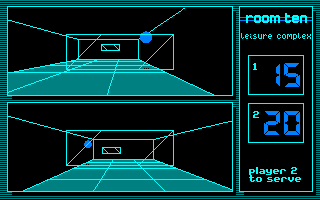 One of these games is glyding, in which two players bounce a ball around a court using a bat. If a player manages to aim the ball so that it hits the wall behind the other player, he scores five points. The first player to score 35 points wins the game. In fact, glyding is nothing more than a 3D version of one of the very first computer games, Pong – and it's actually rather good, although I recommend that you change the default speed setting to something faster, as the game will otherwise be rather boring. You can also change the computer's skill level if you're playing against it, but the game is a lot more fun if you play against a human opponent. Quite an unusual football game, this one, as it is split into two sections – an adventure-style game and an arcade 5-a-side soccer match. 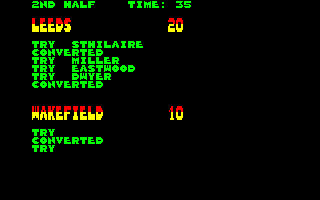 As Roy Race, you must rescue the other members of your football team, Melchester Rovers, who have all been kidnapped. You scamper around the town to find as many members of your team as you can before the 7:30pm kick-off of a vital fundraising match; the number of team members you find is how many you will play with in the match. You can play both sections or just the football match. I found the football match to be ridiculously hard as the player selection is rather frustrating. On a funny note, I think it's the only CPC football game with no throw-ins, as the ball bounces off when it should be a throw-in! Graphically it's nothing special, and the actual gameplay is quite poor as well. Easter Egg writes its letters with gold on the CPC scene, delivering this outstanding remake of one of the most legendary shoot-'em-ups of the 1980s. 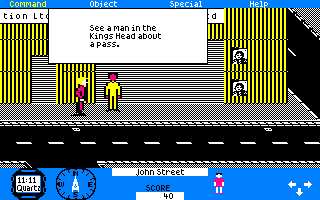 The game is not just an enhancement of the previous Spectrum port, but a brand new game. The game starts with a fantastic cinematographic introduction along with an atmospheric tune. The graphics are fantastic, with precise colour selection, excellent sprite design and effects, while the scrolling is very good. Everything moves smoothly and fast. There are plenty of sound effects and the music changes from level to level. The gameplay is fast-paced and the game is challenging. Collision detection has also improved. The grab factor is very high. Overall, a state of the art CPC experience. See also: R-Type (Electric Dreams). Watch YouTube videos of this game by: jgonza, Metr81, Novabug, Xyphoe, ZEUSDAZ (longplay), ZEUSDAZ (gameplay with commentary). Lead mankind's fight against the evil Bydo Empire in this conversion of the greatest side-scrolling shoot-'em-up of all time from Irem Corporation. Fly the elite R-9 fighter destroying all manner of weird alien creatures using the variety of power-ups available at your disposal, including the all-important special weapon – The Force. 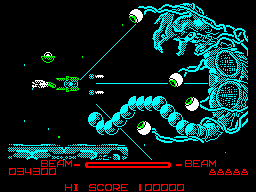 Often imitated, R-Type redefined the genre when it was released with its faultless gameplay. 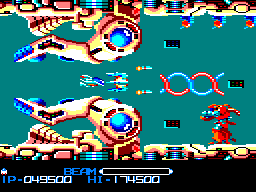 Sadly, this is probably the worst conversion of all, as the graphics are clearly ported from the Spectrum and there's no sound to speak of. See also: R-Type (Easter Egg). Watch YouTube videos of this game by: jgonza, Novabug. Ruff and Reddy have landed on another planet which is inhabited by small beings called Lilli-Punies. They are holding Reddy captive and have ordered Ruff to find some missing Lilli-Punies before the pair are allowed to leave the planet. As Ruff, you have to rescue all the Lilli-Punies on each level. It's a simple platform game with the usual mix of monsters to avoid. Unfortunately you can't kill any of them, which makes the game frustratingly difficult to play. Some of the Lilli-Punies are in awkward places, and it's seemingly impossible to reach them without being hit by a monster and losing one of your three lives. The graphics are nice and colourful, but the difficulty of the game lets it down. Can you manage a Division 2 rugby team and take it to the top of Division 1? This management simulation sees you assuming responsibility of a team picked at random from the twenty available, which seems rather unfair to me; why should I not be allowed to choose which team I want to manage? The game itself doesn't have a lot of options – all the players have just one skill number associated with them, and can play in any position – although some people (including myself) may think that this is not a bad thing. The match highlights progress at a reasonable pace, and you must be careful with your finances; you can't get a loan, so if you run out of cash, you're sacked. It's text only as well, but that doesn't bother me too much, and speaking as someone who doesn't like rugby at all, I don't think this game is too bad. 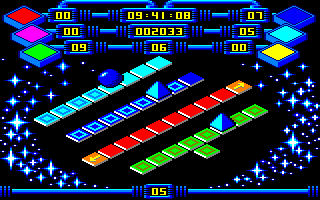 RUN"CPC is an arcade game in which you must try to fly through gates in your spaceship. 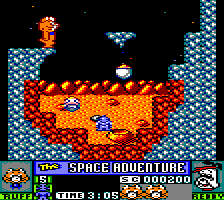 To begin with, the graphics are colourful but plain and there is no in-game music, although there are some sound effects. Nevertheless this is understandable because this game has something rarely seen; it plays in a 3D environment and the gates are essentially complex shapes composed of blocks, and they zoom in really smoothly. I really liked the programmer's effort on this matter. In order to keep the Z80 undistracted, all the effort has been concentrated on maximising the frame rate. The grab factor is not very strong but it is interesting. In general, you really need to play RUN"CPC because games like this do not appear on the CPC very often. There aren't many running simulations for the CPC, but this is one, and it's actually rather good. You take on the role of a coach who trains two runners. Your ambitions are to get these runners to win Olympic gold medals and break the world record in the 400m, 800m and 1500m events – but who said this was going to be easy, with 39 other runners sharing your aspirations? You start off by running in local meetings, then hopefully you will qualify for Crystal Palace, the European Championships, the World Championships, and finally, the Olympics. 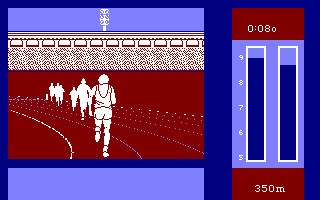 Fortunately, this does not involve lots of joystick waggling (and breaking); instead, you must pace the runners by moving a bar up and down, so that they have sufficient energy to last throughout the run. It works quite well, and the animation and graphics are really good too.